In a move to look into issues and challenges being faced by India in maintaining a cordial relationship with Myanmar in coming days, a two-day ‘Bharat – Myanmar Seema Chintan Baithak’ was inaugurated at the Conference Hall of Department of Art & Culture at Palace Compound in Imphal on Wednesday. 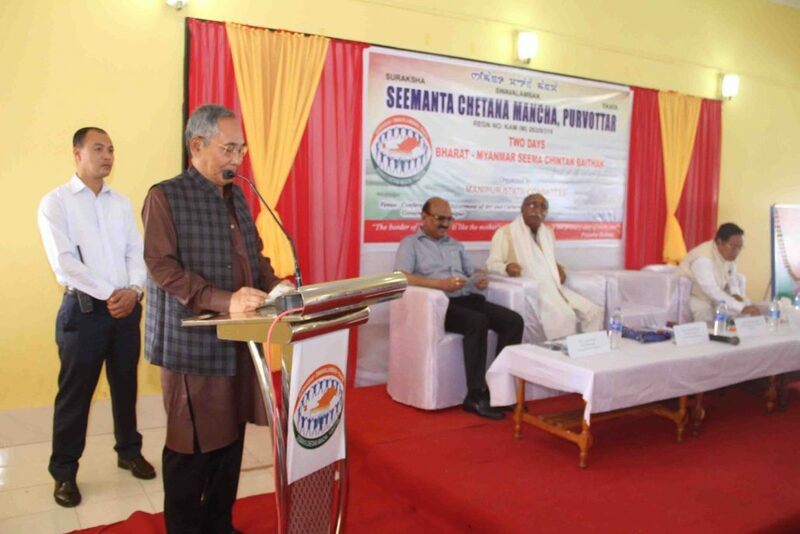 Manipur Deputy Chief Minister Yumnam Joykumar Singh inaugurated the conference which was organized by Seemantha Chetana Mancha, Purvottar. State Chief Secretary Dr J Suresh Babu, All India Convenor of Seemanta Chetana Mancha Gopala Krishnan and delegates from Arunachal Pradesh, Nagaland, Mizoram and border districts of Manipur participated in the conference. Addressing the inaugural function of the conference, Deputy Chief Minister Joykumar said, Manipur shares a long porous border with Myanmar and there have been many contentious and wide ranging issues between the two neighbours. He said, there has been a paradigm shift in controlling the border areas in both sides for the last many years. Although, many issues like drug trafficking, militancy and infiltration etc are yet to be discussed and addressed. Stating that lot of differences in terms of border management are being seen in different border areas of the country, he said as the state shares a difficult terrain with Myanmar, it may not be possible to fence all across the border. “If we can maintain a cordial relationship with Myanmar, most of the issues can be solved,” he added. In his speech Chief Secretary Dr Suresh Babu said there has been no tangible effect of Border Areas Development Programme in the North East. He said, the Union Government is committed to solve issues like border fencing, boundary demarcation and dispute over shifting of border pillars at the earliest. Ministry of External Affairs is in constant touch with Myanmar and it will be sorted out soon. He said, Moreh town has to be developed and connectivity in the border areas has also to be developed. All India Convenor of Seemanta Chetana Mancha Gopala Krishnan also spoke on the importance of maintaining a cordial relationship with Myanmar.